The issue of customs tax imposed by Pristina on 21 November on the import of Serbian products is part of the overall negotiation for a definitive solution to the Kosovo issue. At least that is the intention of Prime Minister Ramush Haradinai, who is seeking exhanges to proceed with the abolition of tariffs. But for one to want exchange walnuts for olives is one thing, but to offer walnuts in exchange for the olive grove, it is – if anything – redundancy. Thus, in this maximalist frenzy, Haradinai declares willing to abolish the tariffs by demanding in advance that Serbia sign a binding agreement that it will recognize Kosovo. This requirement goes beyond the limits of reasoning, since Serbia is asked to sign something that does not exist, which has not been the subject of a negotiating process. In essence, Haradinai asks Belgrade to sign, blanco, what will be agreed in the future. In the world of diplomacy, there is still no record of something similar (in time of peace) and the Kosovo Prime Minister may feel proud because he has added yet another weapon to the quiver of diplomacy of the future. But let’s get serious! This pursuit of Haradinai has not only provoked ironic comments but also concerns for the continuation of the dialogue with Belgrade. Washington, a faithful ally and protector of Kosovo, appears infuriated at Haradinai’s behavior. The US Embassy in Pristina has threatened with sanctions, has placed the Prime Minister of Kosovo in a “blacklist” and warned that “the support of politicians who are opposed to the strategic interests of the United States is not a given and they should not believe they will not suffer any consequences”. Washington is in a hurry to solve the issue and Haradinai undermines these efforts. Kosovo’s Prime Minister, however, does not appear to be moved and insists on the customs tax. 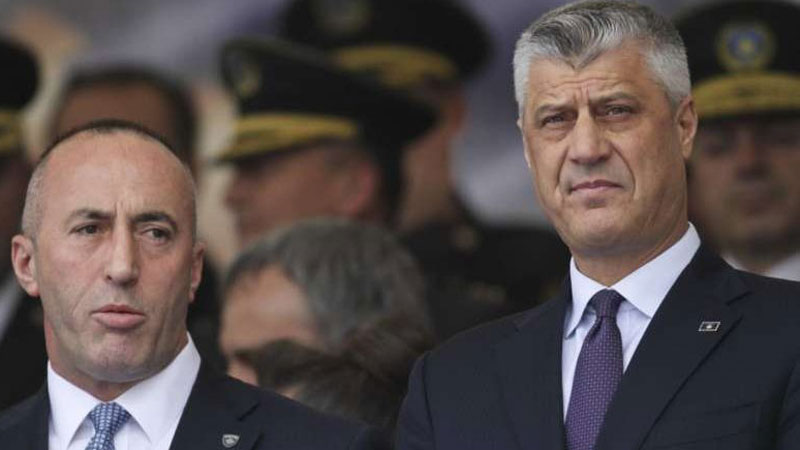 On the other hand, the President of the Republic Hashim Thaci stand with the US on this issue, considering the imposition of tariffs a mistake, yet does nothing to prevent Haradinai’s irrational behavior. Political analysts estimate that the imposition of tariffs is also used as an element of internal political controversy. Haradinai is trying to gain sympathy with the extreme nationalists who support the hard line in the relations with Belgrade, thus stealing voters from the Vetëvendosje movement. Polls have already shown that his Party’s rates have increased since he imposed the tariffs, and it should not be ruled out that he will lead the country to elections when he feels strong enough. Thaci, as more experienced, expects the Americans to “remove” Haradinai and leave him dominating the internal political scene. Belgrade, which is confused and can not believe that Haradinai’s falling out with the United States is not “an act”, would also be accommodated by the removal of the current prime minister from power. Serbia has been estimated to have lost EUR 66 million since the day the tariffs were imposed, and the bad thing is that economists warn that if this period is extended, a market of two million people will be permanently lost, since the gap caused by the shortage of Serbian products is gradually being covered by other countries.